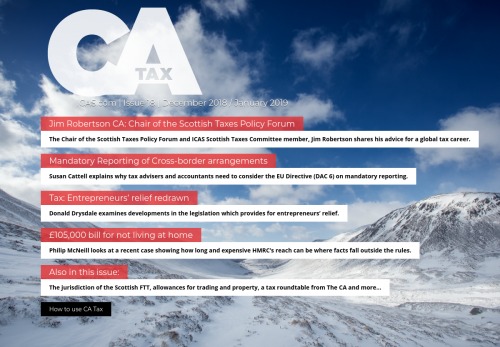 The Chair of the Scottish Taxes Policy Forum and ICAS Scottish Taxes Committee member, Jim Robertson shares his advice for a global tax career. Susan Cattell explains why tax advisers and accountants need to consider the EU Directive (DAC 6) on mandatory reporting. Donald Drysdale examines developments in the legislation which provides for entrepreneurs’ relief. Philip McNeill looks at a recent case showing how long and expensive HMRC’s reach can be where facts fall outside the rules.